This manual applies knowledge of wireless cellular communications to real-world situations that wireless technicians encounter every day. From dBm versus Watts, the difference between analogue, TDMA and CDMA, and testing of handsets and base stations, the book covers all first-tier formats. It seeks to provide a basic understanding of the electronic principles as well as a sound foundation of wireless communications principles, including analogue and digital concepts. 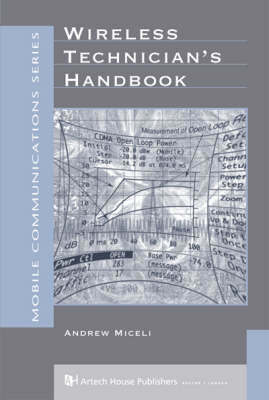 The book focuses on testing concepts and procedures, and types of testing equipment, including spectrum analyzers and power meters and their applications; reviews AMPS, CDMA, IS-136, and GSM; includes charts that technicians refer to daily and screen shots from common test instruments; and surveys common problems with cellular and PCS networks and handsets.